PLEASE READ THE FOLLOWING BEFORE PLACING AN ORDER! In the event that you wish to exchange or return your purchase, please thoroughly read the following. You must adhere to the policy below, or your request for exchange or return will be denied. We do not accept any Return or Exchange on following Items: All Clearance Items. Exchange or return will not be accepted unless pre-authorize by our return department. Request for Return Merchandise Authorization (RMA) number must be made with in 14 days (30 days for Thanksgiving and Christmas Orders) from the delivery date of your package. We must receive return merchandise within 14 business days after RMA Number has been issued. Exceptions for international and APO orders; please inquire at time of request for RMA#. Return freight charges are prepaid by customer. Collect shipments will be refused. Returning merchandise must be sent back in its original factory condition and packaging. We cannot accept items that are not in original factory condition. The return item must have the original labels and tags still attached and undamaged. Items altered in any way, washed, exposed to smells, such as cigarette smoke or perfume will not be accepted. Do not mark, tape or attach anything which may cause damage to the original packaging box. Damaged packaging box will not be accepted for return. Do not send your return order without Return Merchandise Authorization (RMA) number. RMA# must be clearly marked on outside of shipping box, or the package will be refused. Exchange must be equal or lower amount. If exchange item is lower amount, the difference will be refunded to your payment account. Please allow up to two business days for the exchange order to be processed. Exchange orders will be shipped Regular Ground Service. 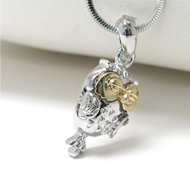 If you have any questions please contact us at info@jewelryshehas.com. 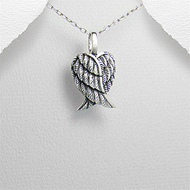 $31.00 (Pendant only : $20.50)!